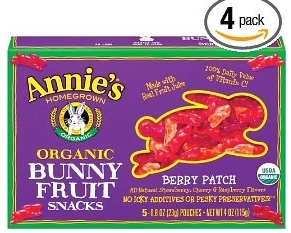 Through Amazon.com you can score 4 boxes of Annie’s Organic Bunny Fruit Snacks for only $14.07 (reg $21.52). They are currently on sale for $16.55 but when you choose the Subscribe & Save option it brings it down to $14.07 plus you get free shipping. Once the product ships, just cancel your Subscribe & Save if you no longer want to receive it. Check out the rest of the Annie’s products as most are reduced as well.